How do you create content that can last forever? Find out how we developed an evergreen piece of content that continues to generate leads for CloudXtract without any advertising spend. CloudXtract is a big data analytics platform that gives companies immediate insight to the health of their business. After their launch in spring 2017, Brightvision helped them build initial brand awareness and launched their first lead generation campaign. This time, CloudXtract needed to generate leads fast to prove traction to potential investors. 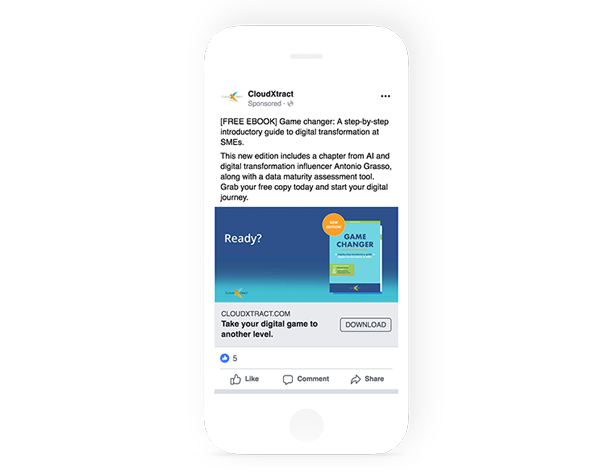 Fueled by our learnings from previous campaign, we set out to build an even more sophisticated inbound marketing strategy for CloudXtract, with the objective to double the amount of leads from previous campaign. We decided to adopt the increasingly popular and effective content strategy known as “Big Rock." This piece of content would serve as the heart of the campaign and drive all our lead generation efforts. To achieve our ambitious goal of doubling the amount of leads, we put together a detailed campaign plan which included all content assets needed, timeline and paid advertising budget. This plan was then adjusted and optimized during our weekly meetings depending on results from the previous week. That's why this time we were ready to step up our content game and try a Big Rock content approach. A Big Rock content strategy means that you’re producing one significant piece of content. There are no rules in terms of format. It can be an eBook, a white paper, a video – as long as it’s big, contains relevant content and of course, is visually appealing. The intention behind a Big Rock piece of content is to own a conversation, or at the very least, have a big influence on a conversation. 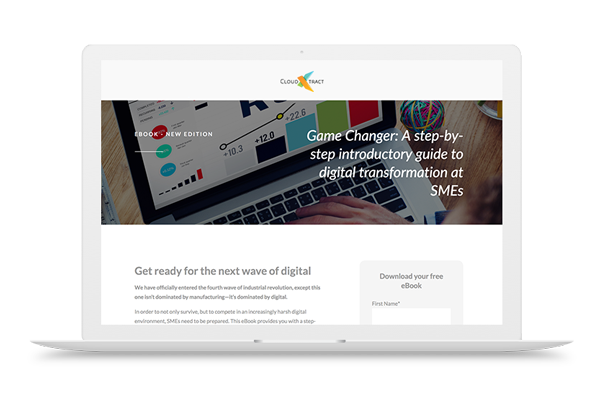 We chose to produce an eBook on the topic "digital transformation" which would serve as the core of the campaign. This was a topic that was highly relevant to the user personas we had identified during our previous campaign (CMO, CFO, CEO). The campaign had one mission: To produce a big piece of content that could serve as a lead generation source in the long term. This time around we were working with very tight deadlines. After our kick-off meeting, we returned the next week to go over our campaign proposal for the quarter. Following revision and budget allocations, we had roughly three weeks to deliver the end product to our client. This meant planning, drafting, editing and designing a significant content piece in 12 business days. A key focus area for CloudXtract was digital transformation. Not only was it a highly relevant topic, but also a conversation in which CloudXtract’s product offer was a perfect fit. Hence, agreeing on the topic was a no-brainer. After a brainstorming session, we arrived at the conclusion that an eBook would be the best format given the topic, the audience and the time constraints we were working with. It was important to have a title that would evoke curiosity and stand out in various social feeds. At this point, the eBook was given the primary title Game Changer. Paid media is an essential part of any lead generation campaign as you can’t solely rely on organic traffic. For this campaign we had a budget of 50,000 SEK that we wanted to distribute across Facebook, LinkedIn and Twitter. When budgeting for an inbound campaign, it’s important to test the waters. Testing and agility are crucial elements throughout the entire lifespan of a paid media campaign. This is to make sure you get the most out of your budget as you optimize campaigns based on performance. Inbound marketing isn’t just about generating new leads. It’s just as much about driving existing leads further down the funnel. An email marketing campaign is a great way of activating your existing database. CloudXtract had access to a partner database and the idea was to convert existing leads in the partner database to CloudXtract’s own leads. We sent out an email campaign to two different segments promoting the eBook launch. This low cost campaign generated a total of 126 leads. Email nurturing is an important part of the lead qualification process. But the point of an email nurturing campaign is not to send out as many emails as possible to as many leads as possible. Based on the lead’s behavior through their recorded activity (in this case, we were keeping tabs on our leads using HubSpot CRM), you can make informed decisions regarding how relevant the lead is for your business. Each email nurturing campaign should have a specific goal. 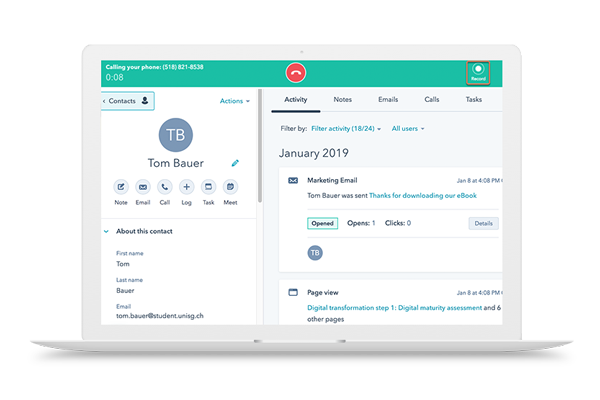 In this case, the goal was to schedule a free consultation with one of CloudXtract’s data experts, and thereby turning the lead into a prospect. As we were operating under strict deadlines during the campaign period, we had a sequence of three emails in place. Email 1: Thank you for downloading. 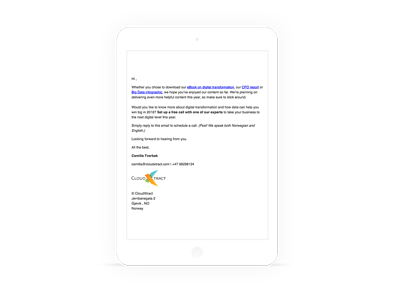 Email 2: Revisit downloaded content and schedule a free data consultation. Email 3: Schedule a free data consultation. In addition, they also handled the demo requests that came in organically on their website. During the follow-up calls, our SDRs focused on understanding how the leads currently analyze their data and what kind of systems and tools they used. This was crucial in order to assess their potential as a prospect and turn them into SQLs. Our SDRs used HubSpot CRM for the qualification process to keep track of their leads, tasks and activities. Out of a pool of 408 leads, which included companies such as IKEA and SAS, our SDRs generated 23 booked meetings. This means they achieved a conversation rate of 5.6%. Our detailed weekly reports would cover the performance across all platforms compared to previous two weeks, ad spend, recommendations for the upcoming week and remaining budget. The eBook keeps generating leads for CloudXtract and has at the time of writing totalled to 600+ leads without any further paid efforts, just through organic search. This goes to show that high-quality content on its own can be a long-term and cost-effective strategy for generating leads.